Mobile carrier KT has teamed up with Lab Genomics, a local gene analysis laboratory, to launch a new DNA-screening test, named NobleGuard, for newborn babies. About 6 percent of newborn babies are born with genetic disorders every year. Even though many of the diseases are treatable when detected early, there is a shortage of screening tests, KT said. NobleGuard, launched on Monday, combines KT’s big data analysis technology and Lab Genomics’ next-generation DNA sequencing technology. Using its DNA database, the test can detect some 50 genetic diseases. KT is pushing to enter the bioinformatics business. In 2012, the company launched the nation’s largest genome analysis platform, GenomeCloud. 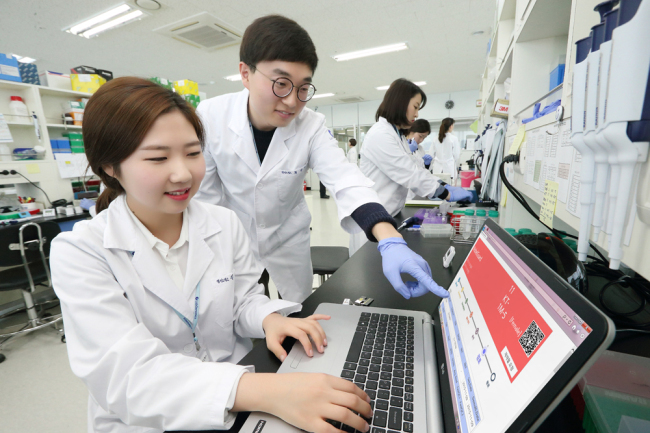 In September this year, the company, together with Seoul National University, opened the Center for Innovative Bioinformatics and Systems Biotechnology to develop cancer genome analysis technology and other related disease diagnosis technology. “Global genome sequencing centers like China’s Beijing Genomics Institute are expected to enter the Korean market soon. We aim to enhance the nation’s competitiveness in the field,” said Cha Dong-seok, executive director of KT’s health care project.